Takes about 10 minutes to prepare. 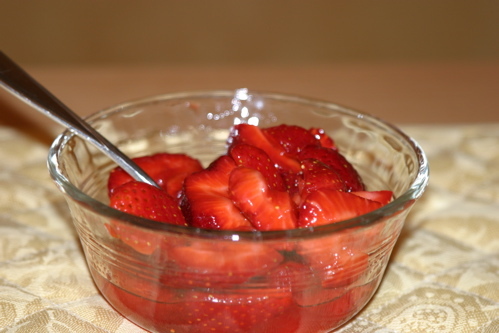 Cut the strawberries in small chunks (cut small ones in half, the bigger ones into 4 pieces) and put them in a bowl. Cut the lemon in half, remove the seeds, and squeeze the lemon on top of the strawberries. Mix everything till the sugar is melted. Over the next 30 minutes, mix in the juice and enjoy! Very nice. I do a similar thing but I use balsamic vinegar instead of lemon juice. A tangy treat! Indeed, just recently we had pork chops with strawberry/balsamic vinegar/basil and it was very tasty too. Do you use sugar in your recipe?